Autism is part of life for guest blogger Sarah Broady and her family. But sometimes her concern for her son with autism ooze into every facet of her life. In the first post in her series about autism overload, she describes how autism is always on her mind. My response? No. Not really. I bet that whatever is most important to a person is most talked about and represented on their Facebook news feed. Mine does include lots of autism posts and memes. Wanna know why? Because autism is kind of a major deal in my life. My son is autistic. That is not something I can ever get away from. The point is, I am usually thinking of autism for a good portion of my day. Every day. I have this blog so I can get those thoughts out of my head. I’m writing a book, so various themes and ideas run through my mind and out into one of the many journals I keep for brilliant idea-writing. As I scroll through my news feed, I read the struggles of other parents–mostly moms like me. Of the fifty+ autism articles, I typically read a few. The articles jump start my thinking on that particular topic, or reminds me of something else about autism. That leads me to talking things out in my blog, or in a few sentences on Facebook to get a conversation going. Despite all of this, I (sometimes) don’t mind all that much. Don’t get me wrong here. It doesn’t mean I like it. I still have my moments when I have just had ENOUGH of autism. Then I call one of my good autism mom friends, and we talk about how we’ve had enough of autism. Even in doing so, we’re still talking about autism. Because it’s part of our lives, and it will not just disappear. All we can do is try to cope the best way we can. 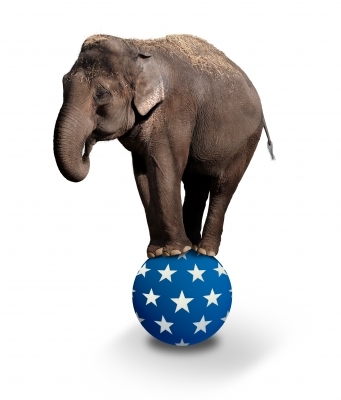 We try to talk about other things, but we can only ignore the elephant in the room for so long. We can’t chat long before one of us whips out Applied Behavior Analysis (ABA) therapy for our son in the middle of the conversation. We don’t even say, “Hold on.” There’s no time. We just start talking to our kid while the other person realizes they are no longer being listened to and waits patiently. Because we get it. And then we laugh, and we sigh. . . or cry. . .
Do You Understand Autism Overload? Can you relate to Sarah’s situation? If so, leave a comment about when autism overload invades your life. And come back tomorrow for the rest of her post about autism overload and the elephant in the room. I hear you, Brenda. It’s good that you recognize that answering questions about how he’s doing can be monopolizing. I’d be interested to hear how other parents deal with this. Any ideas out there? I too am always thinking about autism. But at this stage (my son is 22) I can actually forget it for periods of time. Sometimes I dread the moment someone asks me how my son is doing. There is never a short answer that is the truth. So I have to decide if I really want to tell them or just give the ‘pat’ answer so I can move on to a topic that is actually interesting to all parties involved in the conversation. But I tell them how my son is really doing I tend to monopolize the conversation because it is never a short explanation.